Well its impossible to describe to anyone not in this country the difference to the weather that took place on Sunday! From being blown away standing on Truleigh Hill yesterday, followed by sheltering in the car in Budgens car park refusing to get out until the rain/hail had stopped pounding down, Sunday dawned with still air, and cloudless blue skies. Mind, it was COLD and I had to scrape the car to get out and pick up Hugh. The organisers took a big hit 2 years ago when they got the distance wrong, and have been criticised by runners in the past for over-optimistic organising, but after last year being voted ‘Most Improved Race by Runners World, they really hit impressive form this year! The seafront looked great, paths had been cleared through the sea of pebbles down at the Hove end, and everything ran like clockwork (note: self not included! :)). Hugh and I swapped identical frustrations at why we both still get nervous before races – he is obviously vastly more experienced than me yet still had a sleepless night – like I did! We’re old enough to know better, but clearly don’t! Deciding what to wear was a real issue – we could see it was very sunny, but 1c as we entered Brighton, and all the streets to the front were in shade – yet we knew we’d be warm once we started. What a dilemma! Hugh opted for 2 layers, so he could (and did) remove one when he got too hot. I resorted to my usual ‘black bin liner’ couture, discarded at the Start area where the sun warmed us up. The race itself? Sunny, and once you got going really quite warm – lots of people out cheering everyone on which certainly kept me trotting (not good to drop to a jog/walk when the crowds are at their thickest!) – it really was a LOVELY morning! We didn’t see any other Joggers (correction, Hugh saw Lotte passing him And I’m sure I saw Joyce passing me in the last painful mile!) but well done everyone. Results for everyone I can find are below – I checked people entered under Henfield Joggers (does anyone know who Steve Robinson is by the way? He isn’t an actual Member! ), and I knew a couple of other people who I looked for, but if you’re not included drop me a line and I’ll correct. Ilidia didn’t actually generate an official time, I imagine as the result of being a Pacemaker, but as she was the 2:30 pacemaker I am totally confident that she would have finished exactly on schedule! After a month off running for various reasons my legs felt shattered – that was as painful a run as I’ve ever had. 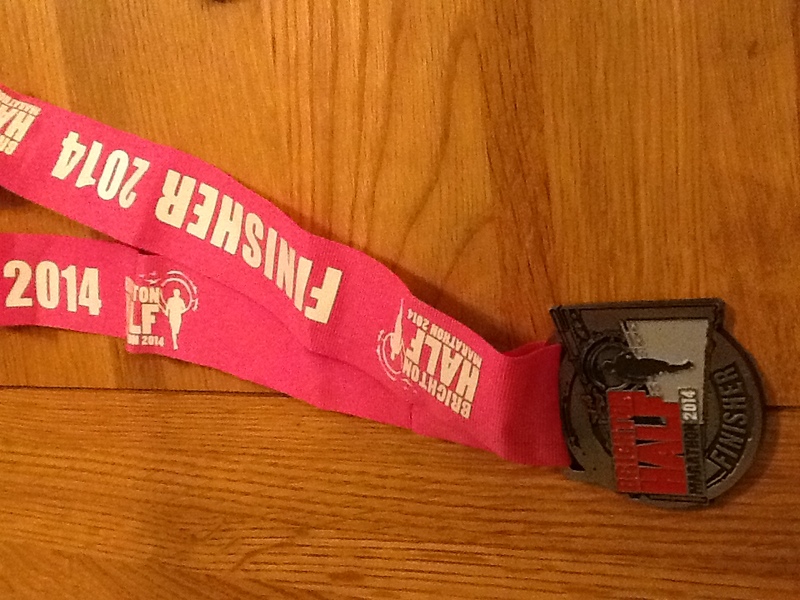 BUT its worth it for that lovely medal with the terrific Brighton-esque pink ribbon!